DETROIT (AP) — Ricky Rubio was inbounding from the left corner — not the easiest angle for the most important pass of the game. 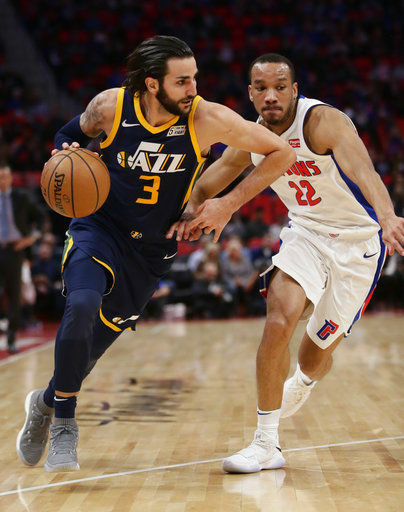 Ingles made a tying layup in the final seconds of regulation, then added two straight 3-pointers in overtime to lift the Utah Jazz over the Detroit Pistons 98-95 on Wednesday night. The Pistons lost their sixth straight by blowing a nine-point lead late in the fourth quarter. Detroit had a chance to tie at the end of overtime, but Tobias Harris missed from the left corner, and the rebound went out of bounds off the Pistons. 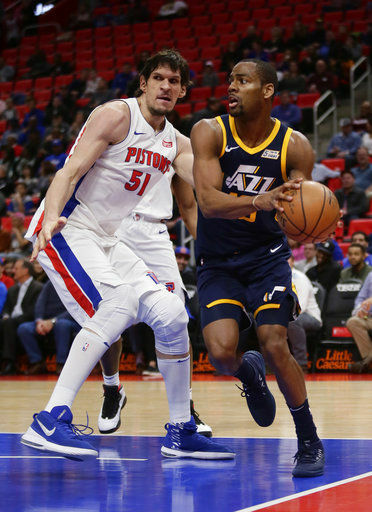 Andre Drummond had 30 points and 24 rebounds for Detroit, and he fueled a 10-0 run that put the Pistons ahead 88-79, but Utah closed strong in the fourth. Down by two, Mitchell had a spinning, driving shot blocked out of bounds by Drummond with 5.9 seconds remaining. After a timeout, the Jazz had to inbound from over in the corner. Mitchell cut toward the basket from the left side, then circled back toward the top of the key. Ingles then made his own cut along that same path with Detroit’s Stanley Johnson trailing him. Drummond was patrolling the area around the basket, but he was a few feet from the hoop. Rubio had a clear lane to pass to Ingles, who caught the ball under the basket and was able to <a href=”https://twitter.com/utahjazz/status/956363236558778368″ target=”&mdash;blank”>lay it in</a> before Drummond could recover and block the shot. That layup tied it at 89, and Luke Kennard’s perimeter shot at the other end missed. Drummond opened the scoring in overtime, but Ingles made his two 3-pointers and Mitchell added one of his own to put the Jazz up 98-91. 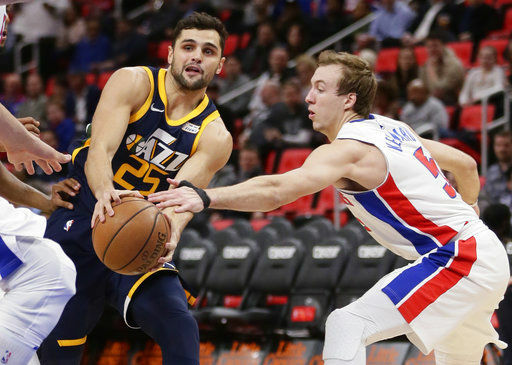 “We had a great look to win it at the end of the fourth and a great look to tie it at the end of overtime, but we didn’t make anything,” Pistons coach Stan Van Gundy said. Drummond surpassed 2,000 offensive rebounds for his career. At 24, he became the youngest player to reach the mark. Dwight Howard and Moses Malone did it at 25. Drummond was left off the All-Star team this week, and a message Tuesday night on his <a href=”https://twitter.com/AndreDrummond/status/955957174974537730″ target=”&mdash;blank”>Twitter account</a> — “Guess I gotta start doing back flips after every point I score to get attention around here!” — suggested he wasn’t thrilled with being passed over. He played a terrific game Wednesday, scoring the first seven points of Detroit’s big fourth-quarter run. “Andre did everything for us tonight, but the rest of us have to give him more support,” teammate Anthony Tolliver said. Down nine with 3:17 to play, the Jazz scored eight straight points to get back in it. Rubio then had a pass stolen, but Drummond made only one of two free throws with 11.8 seconds left, and Utah got the ball back down two. Jazz: Mitchell and Rudy Gobert scored 15 points each. Rubio had 11 points and 10 rebounds. … Rodney Hood (lower leg) did not play. … Rubio went to the locker room with 5:31 left in the fourth when he appeared to be bleeding around the eye. He was able to return. Pistons: Reggie Bullock (right thumb) missed the game. … G Langston Galloway made his first start of the season but scored only five points. Jazz: Visit the Toronto Raptors on Friday night. Pistons: Host the Oklahoma City Thunder on Saturday.